Cheese. Cheeeeeeeese. Glorious cheese. Let’s take a moment to reflect on that. A moment of silence for cheese. Our family loves cheese. In all it’s types, colors, flavors. In all it’s cheesy glory. We might even have a mild case of cheese addiction. Ok, we do, and ‘mild’ is probably an understatement. But, can there really be such a thing as too much cheese? Definitely not. That being said, we all love a good, crisp, slightly crunchy grilled cheese with an ooey, gooey melty center. You know that part where you cut it in two, or in quarters, and pull out strings of cheese that could stretch forever when you try to take that first bite? Yeah, that’s my favorite part. My kids’, too. As I’ve grown, you know into a ‘responsible adult’, there are some things from my childhood I’ve never been able to let go of. Despite all the changes of adulthood & parenthood, my love for a grilled cheese has not abated or been diminished. Luckily for me, my kids have inherited that same affinity. However, in an effort to appear grown up when I devour one, I’ve tried very hard to create and make ‘grown up’ grilled cheese sandwiches. I couldn’t leave them behind, but I did have to make sure they, at least some of the time, appeared to evolve with me. 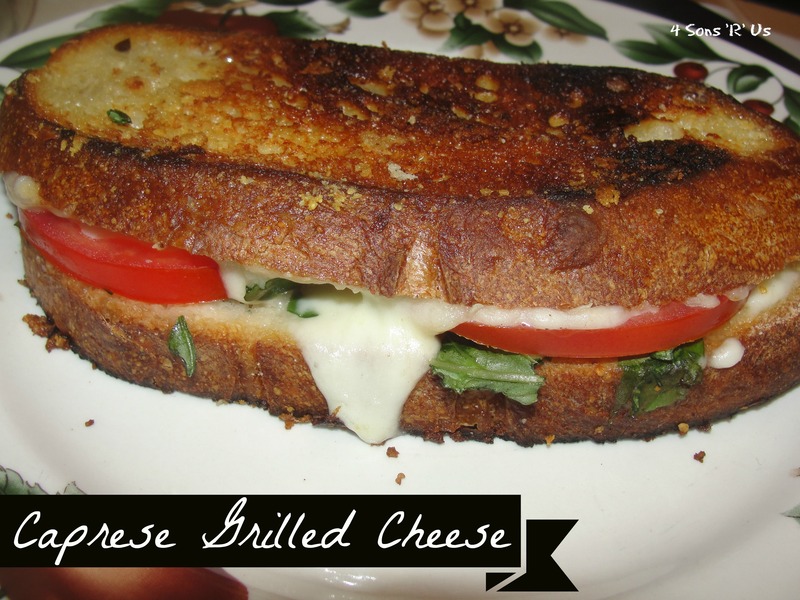 Caprese Grilled Cheese is one of my favorite ‘grown-up’ versions to date. Everything I love about the original, but heartier. The butter, parmesan crust creates the perfect ‘crunch’ when bitten into. This sandwich offers everything a grilled cheese purist would expect, but has the power to convert all new fans with it’s fancy, shmancy new style. What’s the fun in being grown-up if you can’t be childish sometimes too? Here’s the perfect cheesy compromise. Eat like an adult, enjoy it like a kid. The recipe below is for 2 sandwiches, but it easily doubles, or even triples. So don’t let that hold you back! Heat a large skillet to medium heat. Spread butter on one side of all four slices of bread. Sprinkle the Parmesan evenly over the butter. Put all four pieces of bread, buttered side down into the skillet. Lay, or spread, mozzarella on all pieces of bread. Cover with a lid to keep the heat in and melt the cheese. Once the cheese is melted, lay the basil and sliced tomatoes on top of the cheese. If using vinegar, drizzle a tiny bit ( I use 1/2 tbsp) over top of the tomatoes now. Assemble the sandwiches by putting the tops on. 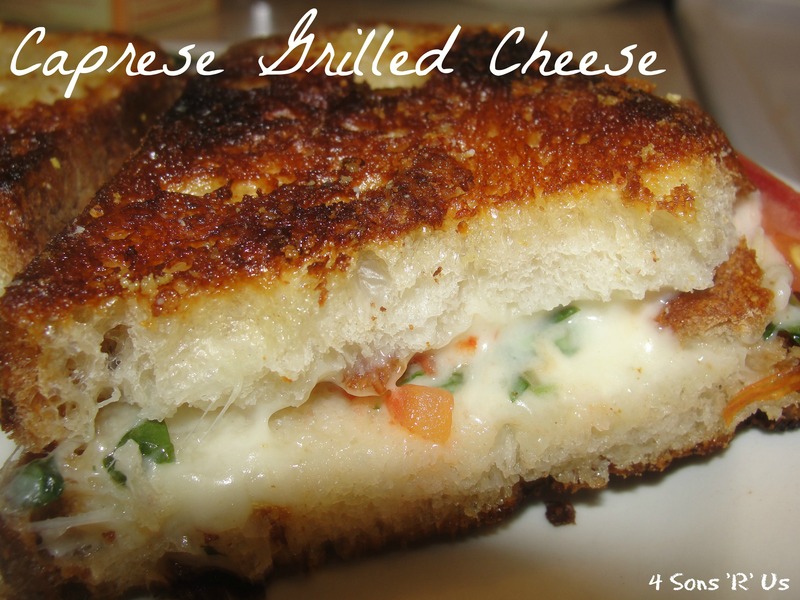 Posted in Recipes and tagged adult sandwich, caprese, grilled cheese, grilled cheese sandwiches, mozzarella, tomatoes. Bookmark the permalink.